A new mission was released by Cm_Blast, “The Rebellion of Atreides”. Cm_Blast is at it again, this time he has created a campaign mod titled “The Emperor Returns”. What makes this mod somewhat unique compared to his previous work is that this mod uses tibed to change core gameplay. Hey everyone, it’s been awhile since I’ve been able to make changes to the site so I made the time to sit down and make some improvements. First, I’ve updated all the mod and patch download pages to have links to VirusTotal scans for each file. Previously mods imported from the old website did not have a link to these scans, which made things difficult to verify as safe for new users. I’ve also taken the chance to clean up the formatting on these older pages to match the new template. Second, I’ve begun reorganizing the mod downloads to be more user friendly. Previously all the mission mods were together in one category. Not only is this hard to view as one massive menu, it makes it hard to differentiate single missions (which are quick and easy to enjoy) and campaigns (which require a larger time investment). Ultimately, I believe this change will help a wider variety of mods become more accessible to players. I plan to do additional organizational changes to improve the mod browsing experience when time permits. Finally, two new mods have been added to the site. Anti-Fremen Campaign and Frank Herbert Campaign both by Cm_Blast. Make sure to check them out. There was a broken download link on the images page, I’ve corrected the issue and confirmed it is again working. Cm_Blast has created another new Campaign mod titled “Fremen Warriors”. This campaign focuses on the stealth and expert ambush tactics of the fremen. Some new tools have been uploaded by Klofkac. The first is an updated version of his Map and Mission Editor, it includes a variety of features (too many to mention here). A new tool from Klofkac being uploaded here for the first time is the Tile Atribute Editor. This is a unique tool for editing TILEATR*.BIN files where tileset attributes are stored (where vehicles or infantry can or cannot pass, where you can build etc). Cm_Blast has created another new Campaign mod titled “A New House”. 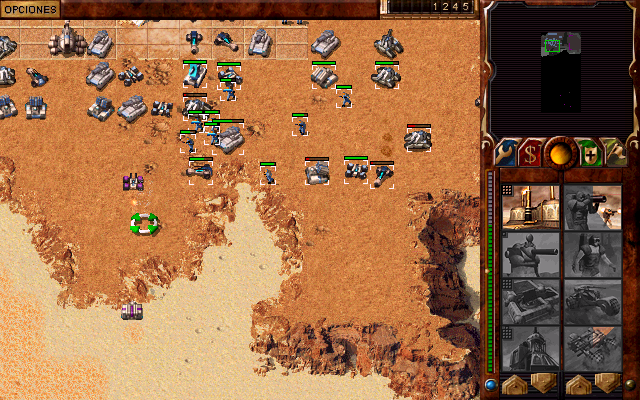 This mod introduces a new house to the fight for Arrakis, one not used in the official game. Cm_Blast has created another new Campaign mod titled “Butlerian Jihad”. This campaign allows the player to play as each of the major houses as they attempt to uncover the mystery of events transpiring around them. Cm_Blast has created another new Campaign mod titled “Smugglers – Mini Campaign”. This 4 mission campaign features you as the Smugglers, hunting for the valuable spice melange. Cm_Blast has created a new Campaign mod titled “The Spacing Guild”. In it you explore the new concept of the Spacing Guild, a faction to which the numerous great houses owe a significant debt.